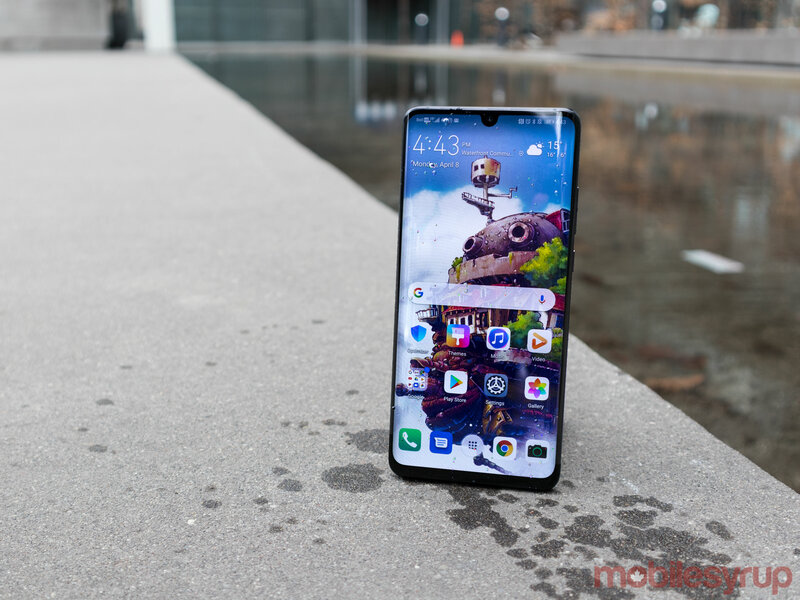 Huawei is becoming the talk of the town and not only because of its issues with the Canadian government. More and more, I’m starting to hear people talk about and use Huawei smartphones, despite the U.S. government’s overall negativity towards the Chinese company. I was at the barbershop the other day when I overheard someone excitedly talking about Huawei’s foldable handset, the Mate X. 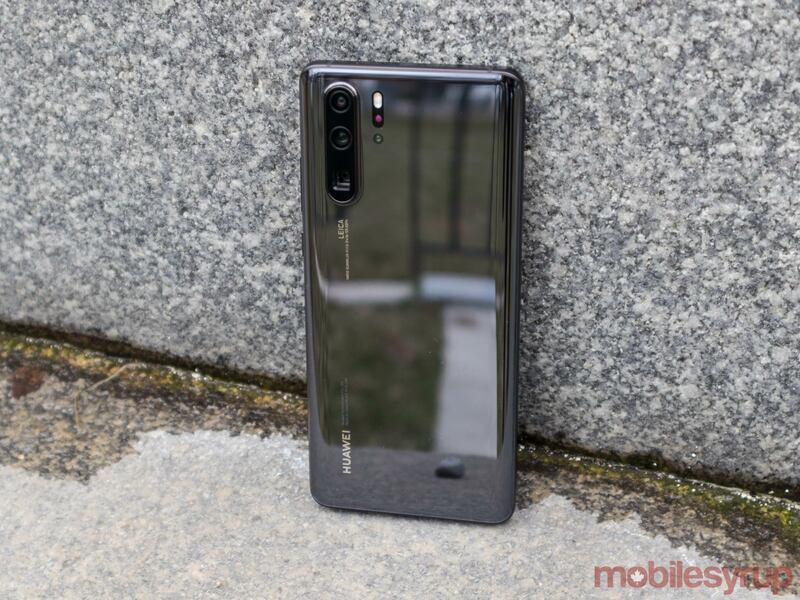 While this isn’t a review for that device, it shows that Huawei is beginning to become a household name in Canada. 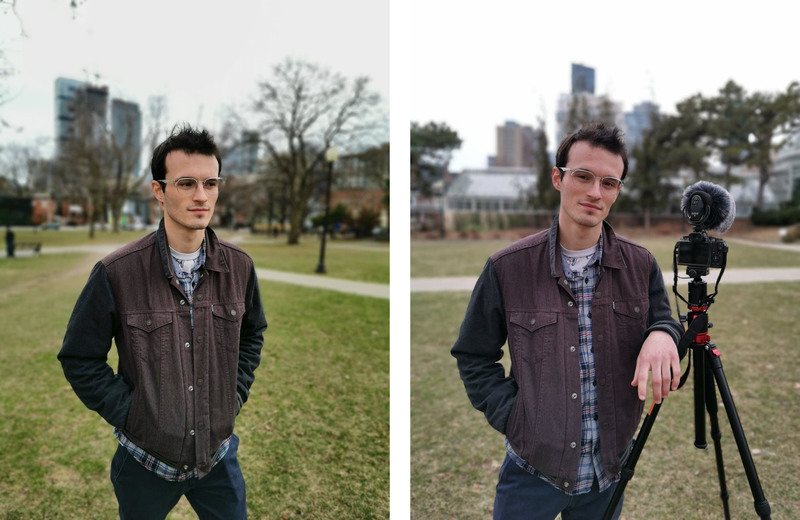 Whenever I show someone the P30 Pro or even the older P20 Pro, the first thing they typically say is “I heard that this is good for taking pictures,” and they’re exactly right. When Huawei tweaks its P-series, the company focuses on two things: photography and design. The P30 Pro is a step above its predecessor, the P20 Pro, in both categories. That said, the phone feels less like a completely new device and more like a bigger, photography-enhanced Mate 20 Pro. As I mentioned, one area of focus for Huawei with the P30 Pro is design. The company used similar elements with the Mate 20 Pro, adding a slightly curved OLED screen. The display doesn’t curve as dramatically as Samsung’s recent S10+, but it’s still quite evident. The P30 Pro’s screen measures in at 6.47-inches with a 19:5:9 aspect ratio and features dimensions of 158mm x 73.4 x 8.4mm. In terms of resolution, the P30 Pro features a 1080 x 2340-pixel screen, with a 398 pixel-per-inch (ppi) density. Purely based on specifications, the screen is not as good as the display featured in the Mate 20 Pro. However, it’s difficult, but not impossible, to spot the differences. The handset includes HDR10 support but lacks Dolby Vision. You can subtlety notice differences when it comes to things like sunsets and explosions with the Mate 20 Pro, which offers a wider range of colours, while the P30 Pro is a little washed out in comparison. This isn’t very noticeable unless you place both phones next to one another and you’re comparing specific scenes. Similar to the Mate 20 Pro, the P30 Pro offers the ability to control the colour and temperature of the display and features an easily accessible eye comfort mode that instantly makes the colours on the screen warmer. Further, the P30 Pro does get brighter than the Mate 20 Pro. What’s also noteworthy is that the screen on the Mate 20 Pro produced a blue colour variation around the edges of its display. While that type artifact is still present with the P30 Pro, it’s less noticeable and purer white than blue. Huawei reportedly sourced the panels for the Mate 20 Pro from LG Display. 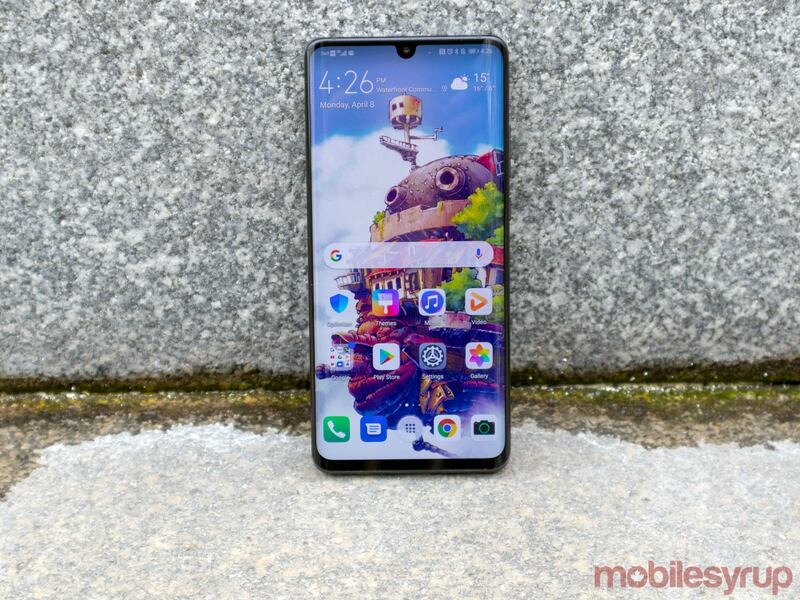 New reports suggest that the company changed display suppliers for the P30 Pro. When I asked Huawei what company makes the P30 Pro’s display, it declined to answer. Overall, while the screen isn’t perfect, it still looks good. The phone features an optical in-display fingerprint scanner that works so quickly that it’s even a bit faster than the S10+. However, due to its optical nature, the sensor is not as secure as the ultrasonic scanner within the Samsung Galaxy S10+. At the top of its display, the phone also features a waterdrop notch rather than an iPhone X-style notch. 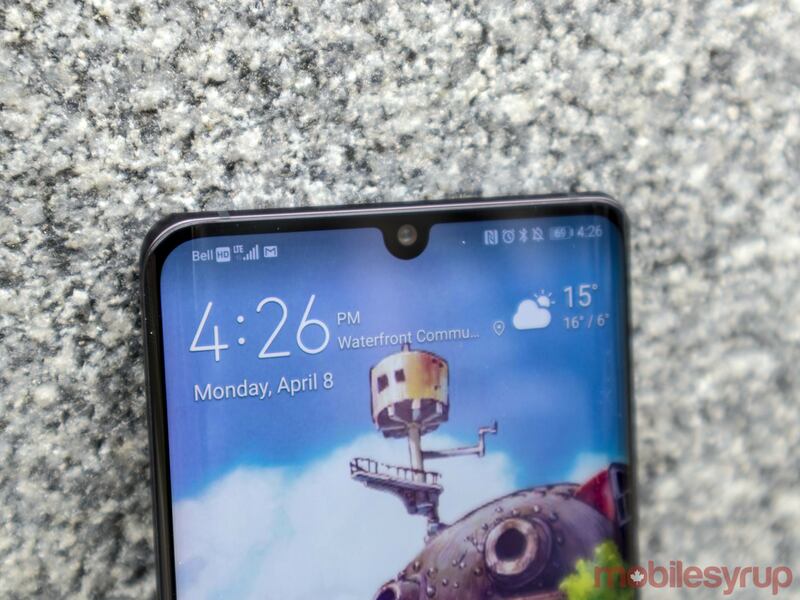 It would have been nice to see a hole punch display like on the S10 series or Honor View 20 (which Huawei also makes). 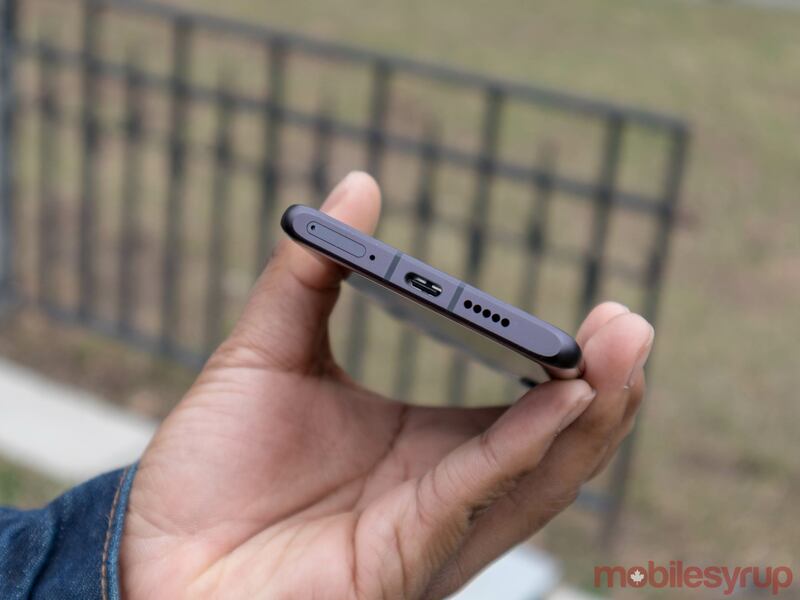 On its bottom, the handset features a single USB Type-C port and a downward facing speaker. On the right of the phone, there’s a volume rocker, as well as a power button. At the top, the P30 Pro has a good ol’ infrared blaster, which turns the phone into a remote control for your TV. 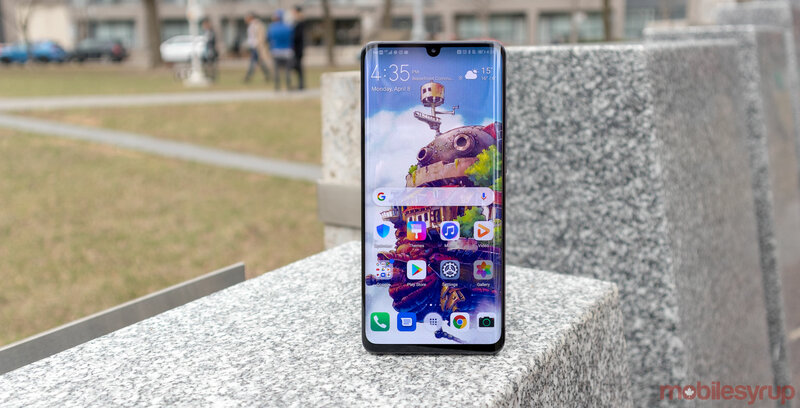 Oddly the phone has an oval shaped flat top that allows users to stand the P30 Pro on its head on a table or other flat surfaces. I wouldn’t suggest doing this as it’s still a phone and can easily topple over. The P30 Pro sports rounded corners and with the above-mentioned curved display I feel that it fits easily in my hand, but it’s a bit top heavy. The P30 Pro weighs 192g, with a lot of the weight in the top half of the device because of its protruding rear-facing camera setup on its back. The handset comes in ‘Breathing Crystal’ and ‘Black’ in Canada. The Breathing Crystal colour looks fantastic and changes depending on the angle you hold the phone. What might be the only thing that’s more important than the P30’s design is the smartphone’s stellar camera array. 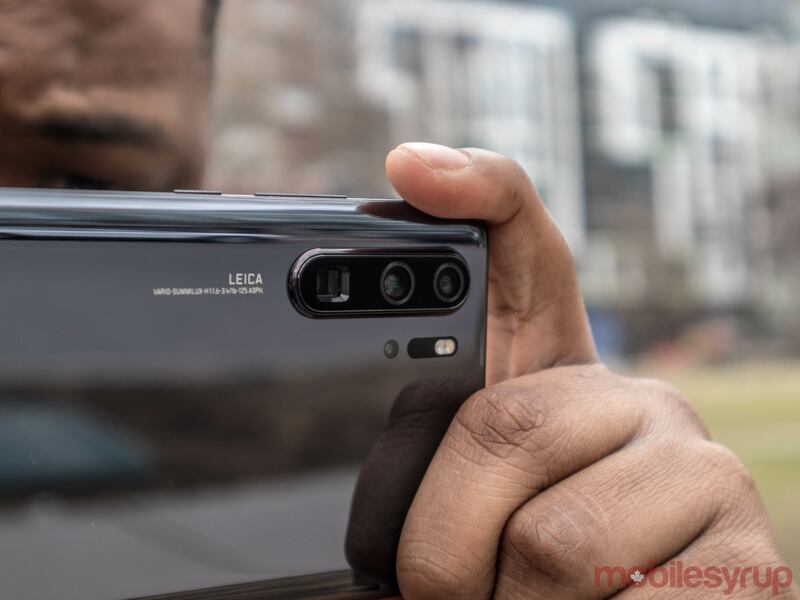 Huawei stacked its P30 Pro with a quad camera setup featuring a 40-megapixel Super Spectrum sensor, a 20-megapixel sensor with an ultra wide angle lens, like on the Mate 20 Pro, an 8-megapixel periscope zoom lens and a time of flight sensor. What’s special about Huawei’s camera array this time around is its ability to capture more light. Instead of a typical RGB Bayer filter, Huawei replaced the sensor’s green colour receptors with ones that capture the yellow light spectrum, creating an atypical RYYB Bayer filter. 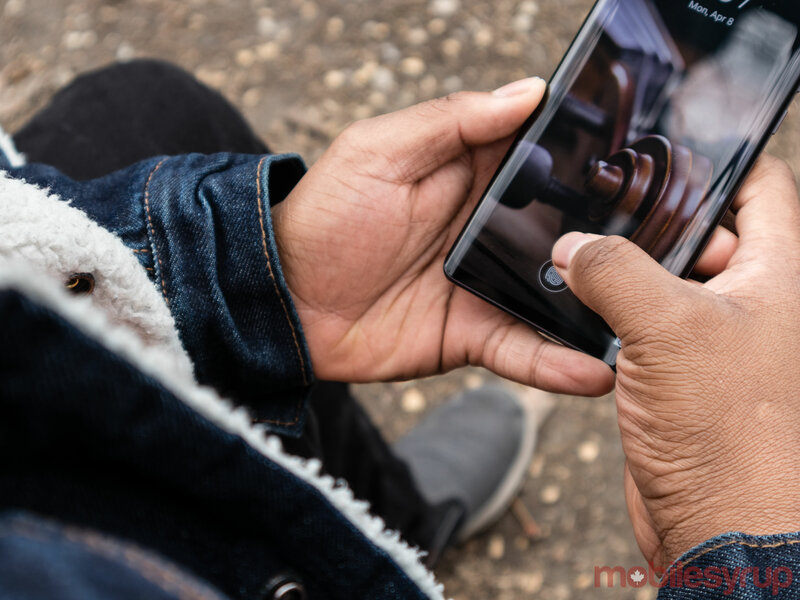 According to Huawei, the yellow light receptors can capture 40 percent more light than their green counterparts, which lets the phone take brighter pictures than the typical smartphone camera. The phone is far superior to the P20 Pro and Mate 20 Pro at taking pictures at night. However, don’t expect the handset to be able to take great pictures in complete darkness. In absolute darkness, users can bump up ISO sensitivity to an astounding 409,600, allowing them in turn to raise shutter speed, but photos turn out grainy, lack detail and are still very dark. When there is a minimal amount of light, the phone performs much better. Don’t get me wrong, the pictures aren’t amazing, and you still lose some detail. In the below image, my co-worker’s hair isn’t detailed and there is some distortion in his shirt as the device found it difficult to make out the pattern. The P20 Pro is on the left and the P30 Pro is on the right. While this isn’t exactly the best picture, it’s far superior to what I was able to capture with the P20 Pro. The same picture taken with the P20 Pro was a lot darker with less detail and more grain. This is also quite impressive considering it was outside at 11pm at night and we were in between two houses with only the moon to light the scene. In contrast, when there is more light, the P30 Pro’s night mode works best. This likely how most people will take pictures with the smartphone. That said, without actually changing the mode to black and white, I did find that the phone greys out the night sky. In my testing, it seems this happened more often during cloudy nights. I found when I turned off night mode pictures still looked pretty great, though they were darker in comparison. In the dark, the P30 Pro tends to overexpose the light areas of an image, which isn’t always necessary. As a result, if you’re finding the P30 Pro creates a lot of light halos around street lamps, you have full control of ISO and shutter speed. This means you can choose to bump down the ISO or shutter speed to avoid that. While the phone can take great pictures in the dark, my favourite thing about is its zooming prowess. The P30 Pro features 5x optical zoom, in addition to 10x hybrid zoom and 50x digital zoom. When using the optical lens at 5x zoom, pictures were just as sharp, clear and full of detail as the basic 1x zoom. I once used the phone to look at a sign that looked at least 10 feet away, and I was able to use the 5x zoom to read the sign, as pictures are still crisp and detailed. Even at 10x zoom, images are still clear and detailed. 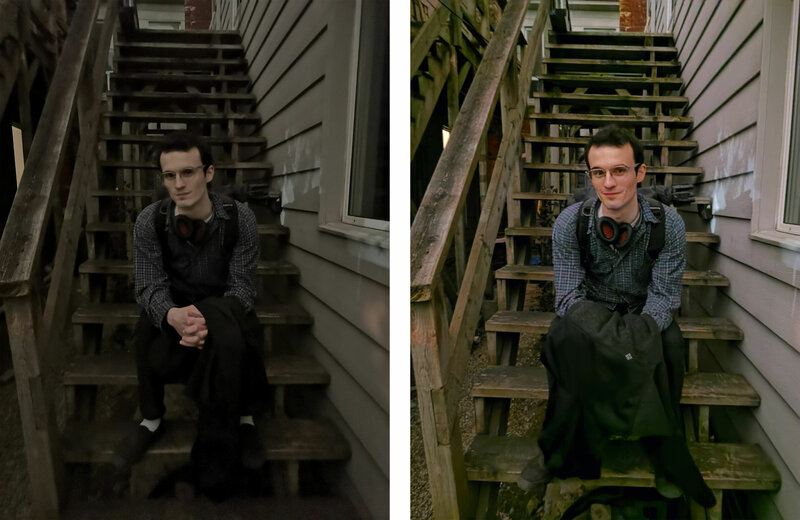 Depending on what exactly you’re taking a picture of, such as intricate patterns or a lot of people, you can easily tell that the image has been digitally enhanced. What Huawei does to achieve 10x hybrid is it has the handset take a picture with its 5x optical lens, crops the image and fills in some of the details with artificial intelligence. The whole process is impressive and works well. Probably my best example of this was looking down at on the streets of New York and being able to read the words on the New York Public Library from the Library Hotel 190m away. With the 50x digital zoom pictures are very digitally enhanced, featuring little detail and any sense of sharpness. However, the phone really feels like it turns into a telescope, allowing you to see objects at a ridiculous distance. With 50x zoom, I was able to read the small fifth avenue sign from the Library Hotel and could look at a weather vane a couple of hundred feet away. 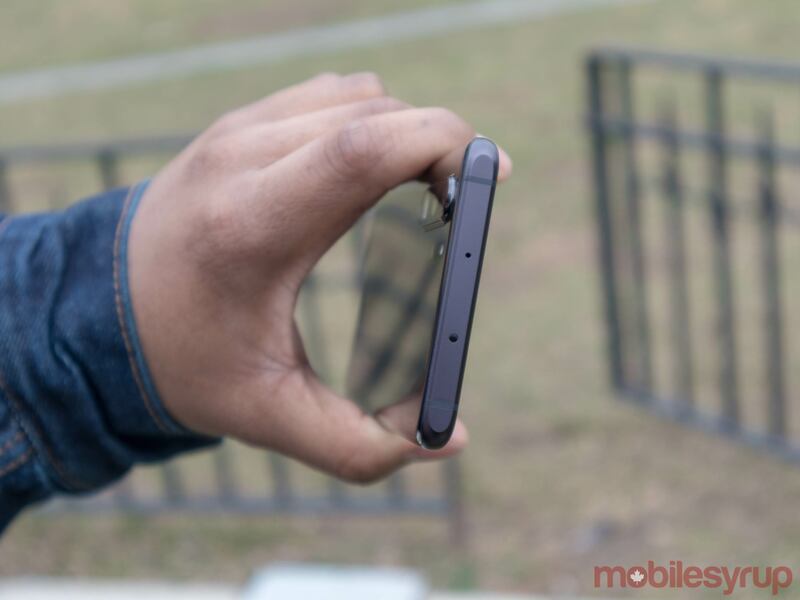 The handset also features an aperture mode that allows users to control how much depth of field you want in an image. The device uses its time of flight sensor combined with artificial intelligence, depending on how much bokeh you want in the picture. You can easily use the portrait mode if your subject is a person. 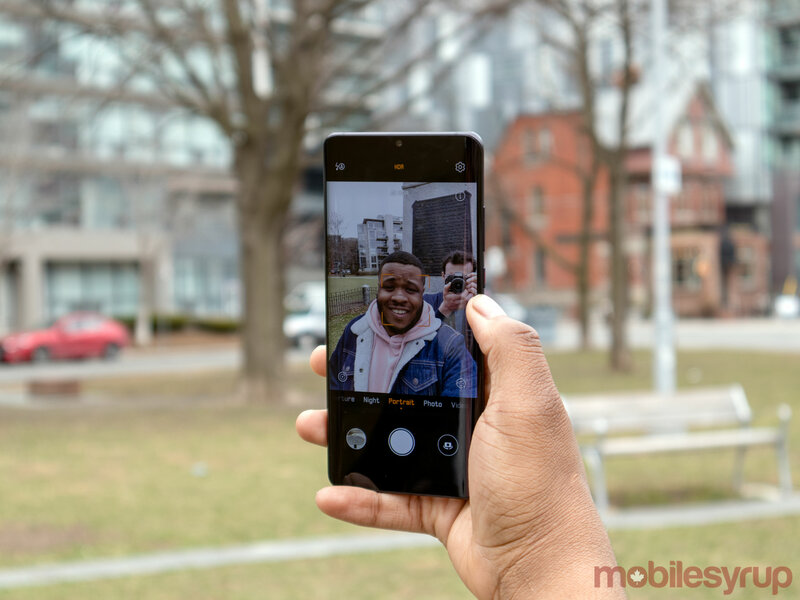 The phone will immediately recognize the user’s face and preset the amount of bokeh. However, if you want more control, you can use the ‘Aperture Mode.’ If you’re really close to the subject you can set a higher aperture and still obtain a very detailed and crisp picture. With an obvious separation from the foreground and the background of the image. If you’re using the aperture mode to take a picture of another person, you can still achieve a good bokeh-style photo. Depending on how low the aperture is set, the more the picture begins to lose details around the edges of the subject. In the below images, you can see the loss in detail in MobileSyrup staff writer Brad Bennett’s hair at the lower aperture. At f/4.0 I can still get the details of his hair, whereas at f/1.6 I start to lose a little more detail. Not that it’s bad, taking aperture shots the purpose of the picture is to blur out the area surrounding the subject. The P30 Pro also has the same ultra-wide-angle camera as the Mate 20 Pro and it works well. It allows for pictures with a larger field of view as well as a Super Macro mode letting users take pictures 2.5cm away from the subject. On the front, the phone has a 32-megapixel camera that is probably the best selfie shooter I’ve used so far on a Huawei smartphone. 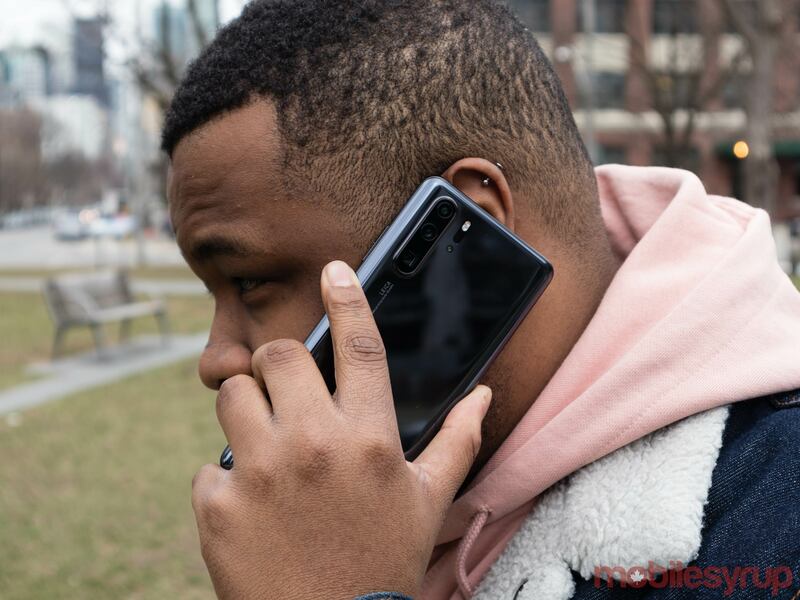 As a black person, I typically find that Huawei’s phones overexpose my face far too much for my liking, but the P30 handles people with darker complexions pretty well. Using the portrait mode the subject will again lose detail, but this time there isn’t much you can do about it except turn off portrait mode. The handset lacks a front-facing time of flight sensor like the LG G8 ThinQ. Personally, I prefer the selfie camera featured on the Pixel 3 XL. That said, Huawei’s camera technology definitely has come a long way in the last few years. Huawei’s latest handset is a battery powerhouse. The device is capable of pumping out over a day of usage easily. In one particularly impressive charge cycle, the P30 Pro lasted me from 6pm in the evening to 1:30pm the next day. On that occasion, I had a little under 10 hours of screen on time and spent a lot of time testing out the camera. In another situation, I even had 16 hours and 57 minutes of screen on time. On that day, I mostly spent time scrolling through Instagram and less than 30 minutes watching videos on YouTube. I also used the eye comfort mode, which changes the colour temperature of the display and I dimmed the screen to about 50 percent brightness. I found it offered a smooth experience and I was able to play Asphalt Xtreme with absolutely no issues. The game ran smoothly and even after 10 minutes, the device maintained a cool 27.5 Celsius. Also, rapidly switching between multiple apps offers a smooth experience with the P30 Pro. Regarding benchmarks, the phone hits a single-core score of 3,276 and a multi-core score of 9,799 on Geekbench. While this isn’t the best score out there when compared to other Android devices it’s still very respectable. Update:04/12/2019: Changing my cons from waterdrop notch to EMUI 9.1 because, the waterdrop notch isn’t actually bad, especially compared to a Pixel 3 XL’s huge notch. EMUI 9.1 isn’t the worst thing ever, however, it’s still far from being a great UI, which is why it’s can be considered a con. Overall, I really like the Huawei P30 Pro. It features a large display, an amazing battery and a great camera. This is also the first IP68-rated P-series handset, which means you can get it wet if need be.. While I would have liked the phone to feature a headphone jack or a hole punch display, as well as perhaps a higher resolution screen, the P30 Pro is a solid smartphone that I would recommend to anyone looking for a device with a good camera and a battery that can last longer than a day. The phone starts at $1,100 outright, but most people will likely get the device on contract. Depending on which carrier you’re with, the phone starts at $149.99. "I'd recommend the P30 Pro to anyone looking for a device with a good camera and a battery that can last longer than a day"